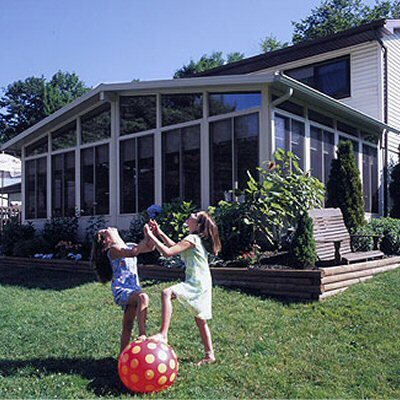 Add a seasonal or year round sunroom to your home and increase it's value, livability and comfort. Remodeling Magazine reports that "the resale value of a sunroom averages 89% - 115% of original cost", and "homeowners can recoup up to 100% of their investment in a sunroom after just one year". Over 500,000 Americans add a sunroom to their home each year, says Qualified Remodeler Magazine; and a sunroom is used an average of 4 hours per day (Remodeler Magazine). Although we can give you an aluminum sunroom, a vinyl sunroom looks like it was meant to be a part of your home. There are many benefits to using vinyl vs. aluminum. Vinyl is now the material of choice for many other building products, such as siding, and windows. LoE3 glass maintains indoor comfort levels. In Summer it keeps the cool air in and the warm air out. Additionally, it reflects damaging UV rays as it lets in light. During Winter, LoE3 keeps the warm air in and the bitter cold air out.